Violent clashes in Hong Kong Jump to media player There have been violent clashes in Hong Kong between police and pro-democracy protesters. Hong Kong police beating complaint Jump to media player A protester in Hong Kong has lodged a complaint of police brutality after video footage appeared to show officers kicking him for several minutes. 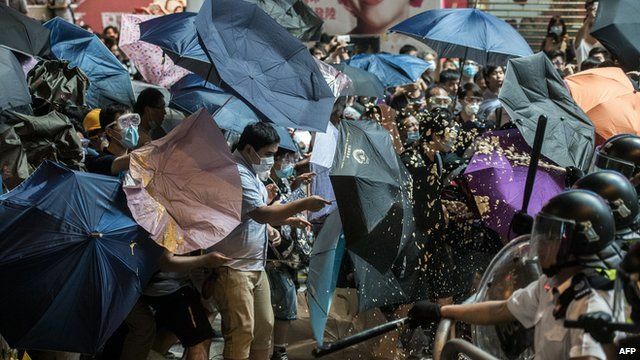 Hong Kong 'umbrella' art movement Jump to media player The umbrella, which has become a symbol of the pro-democracy protests in Hong Kong, has spawned an art movement all of its own. Police move in on Hong Kong protest Jump to media player Crowds of pro-democracy protesters have clashed with riot police in Hong Kong as tensions escalate following more than two weeks of demonstrations. Scuffles at Hong Kong protest site Jump to media player Opponents of the pro-democracy movement in Hong Kong try to dismantle the main protest camp, leading to scuffles with police and activists. Fresh clashes have broken out between protesters and police in Hong Kong, with some officers using pepper spray. The authorities also took away a photographer, working for the Getty news agency. The violence erupted after protesters tried to take back a demonstration site in Mong Kok which police had cleared. Hong Kong's chief executive has said the government could hold talks with the student protesters soon.